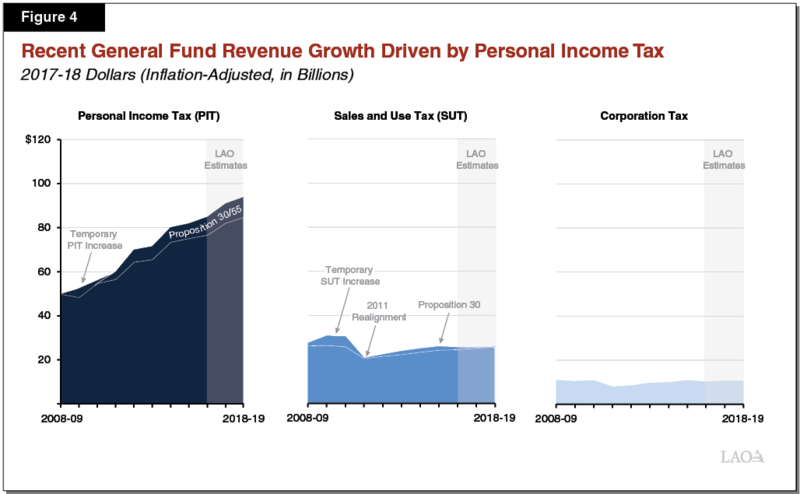 The Legislative Analyst’s Office (LAO) for the state of California, in a report issued this past week, is predicting the growth in personal income tax revenues will continue (see https://lao.ca.gov/Publications/Report/3718). It is also predicting sales and use tax and corporate tax revenues will be flat. Higher personal income tax revenues, with no commensurate increase in sales tax revenues, may indicate that more individual earnings are being directed toward the cost of housing and its related expenditures. The report provides an optimistic forecast for the next year, barring a recession. The LAO’s report will be the foundational document the Senate Budget and Fiscal Review Committee, on which I currently sit, will use as it works with the next Governor and the Department of Finance after the proposed budget for fiscal year 2018-2019, which begins on July 1, is released on January 10th. Consequently, the first proposed budget will set the tone for the next four to eight years. To start the budget discussion, I provided a press release that was picked up by California Political Review, with commentary, and is provided in the piece below. As someone who enjoyed his role as a County Supervisor, one big take away is that Sacramento will take reserves from cities and counties when it runs out of money in a down economic cycle. Accordingly, maybe the Capitol should consider going the other direction when it enjoys a bumper crop? Especially with negotiated promises, like retiree medical and pensions, putting on their ugly squeeze (a concern that even the LAO report raises) on government agencies at all levels. Because, when the economy does cool down, it may be too late for the state to assist. Jerry Brown, and economists believe California will go into a recession in the Spring of 2019. With Newsom as Governor and the Democrats not needing any Republicans to raise taxes, pass single payer, create more big spending programs, like free college tuition, free universal pre-kindergarten, plus $200 billion for the choo choo to nowhere, the plans to blow up the surplus will be laid in January, 2019 with the introduction of legislation. Add to that the Split Roll destruction of Prop. 13 has qualifies for the November, 2020, killing the value of industrial and commercial property—when business realizes that the PPIC poll show this destruction of the California economy would pass with 58% of the vote, we then immediate fall into a recession. “As I detailed in my October report on all 944 public school districts in the state, only about one-third of them enjoy positive balance sheets. Some of the worst balance sheets are in the largest districts. Los Angeles Unified School District is the worst, with a negative $10.9 billion balance sheet, followed by San Diego Unified at negative $1.5 billion; Fresno Unified at negative $849 million; and Santa Ana Unified at negative $485 million. Moorlach is right—we are in dangerous territory. Thanks to AB 1200, the surplus is already gone, if we abide by that law. If we don’t the school districts are bankrupt. Note the mainstream media has not said a word about this impending economic disaster.